60 minutes. Headphones optional. Eyes closed. Not suitable for looping. Includes full usage guide. Take a timely “power nap” to clear your head and give you back the energy you need to get things done. Just got off a long flight, exhausted, only an hour before the next meeting? 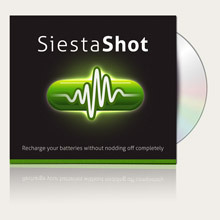 Starting and ending at a relaxed 10Hz, SiestaShot contains every trick in the book to untangle an over-tired brain and give you 40 minutes of quality rest at 1Hz, low delta. Use it at home or in the office, anywhere you think a quick energy zap is necessary.